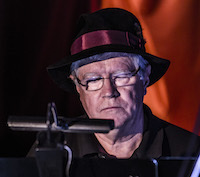 Brian Thorlacius — Lead Alto — Founder and Grand Poobah: Started the band with Rich Condon. 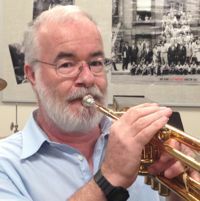 “Retired” high school band director, award winning teacher for 30 years in the Calgary Area. Karen Heaton — Alto — An athlete and dog lover, with some health-care related lab day-job that we don’t really understand. First met Thorlacius when she was 14 years old. When she was four she called attention to her shoes during a recital. 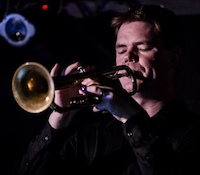 Dave Edgar — Tenor — May be able to fix your horn if you take a stage dive. 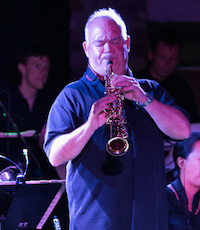 Paul Evans — Tenor — Plays saxophones in various Jazz, Funk, and Blues situations. Production Engineer by day. 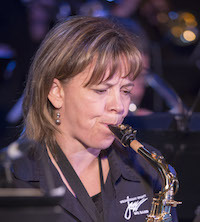 Dana Kaukinen — Bari Sax — Former member of the RCMP Big Band, loves to arrange songs featuring the Baritone Saxophone or Bass Trombone. Played bass trombone with us last year, bari sax the year before, bass trombone the year before that. John Towell — Lead — Nearly an original member of the band, cycled through many other bands on other nights but stuck with us through it all. Recently moved to be closer to rehearsals. Day job: land man. Skier. 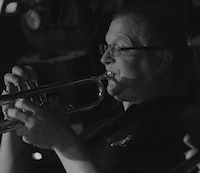 John Abraham — 2nd — Has a secret love for ska, and founded Delirium ska.punk.brass. Plays simcity for real as a day job. Skis a lot. Ask Thorlacius to tell stories about him from high school. 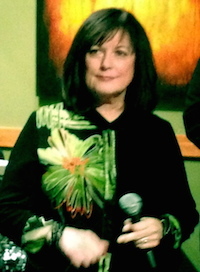 Jacqueline Abbott — 3rd — From PEI via Vancouver etc. Hillhurst chic. Training her offspring to sub for her. Mar James — Bass — Part-time CPA, full-time passionate musician. 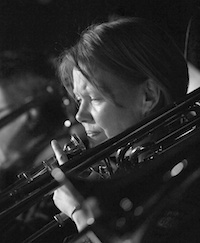 Mar is actually a classical timpanist but is having fun at bass trombone in the Jazz genre. She has a purple thumb in the garden and sings all the time much to chagrin of her kids. 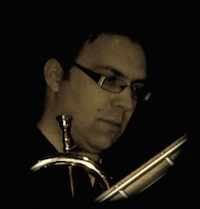 Jon Mossing — 2nd — What to say about Jon? 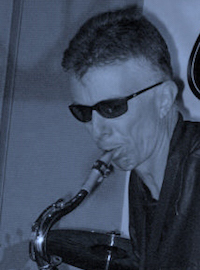 If you’ve heard his solos you’re probably also at a loss for words. Day job: Actuary. 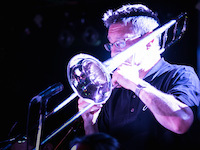 Kevin Waites — 3rd — Trumpet dad (like a regular Dad but much cooler), Non-profit superhero and all around nifty guy..
Michael Hynes — 4th — Michael is a Microbiology Prof at University of Calgary, and is not quite ready to quit his day job. 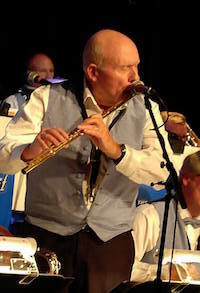 He hopes to go back to University in retirement and learn how to do music properly. 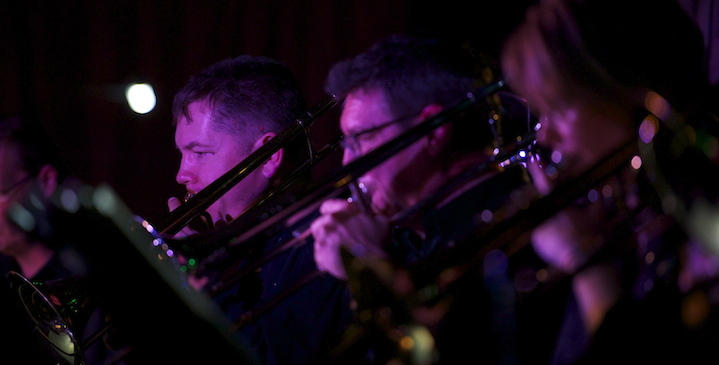 He plays in several big bands in Calgary, and used to be a regular member of the U of C Red Band. 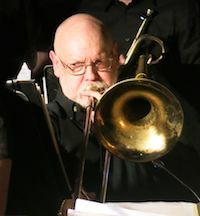 He moved from Lethbridge to Calgary in 1990, and before that lived in Germany, Guelph, Nova Scotia, Winnipeg, and Scotland. 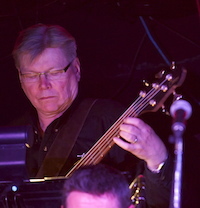 Alex Netelenbos — Bass — One of the longest serving members of the band. Day jobs over the decades have included owning a coffee shop, a framing place, and burning CDs for musicians. 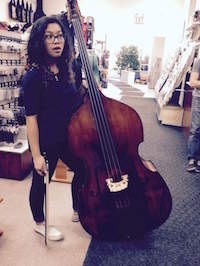 Gabriela Laconsay — Bass — Student at Saint Mary's high school (Go saints!) Shortest kid in band with the biggest instrument around. Forced to give up basketball to do all the music she can. Jazz and orchestra lover. 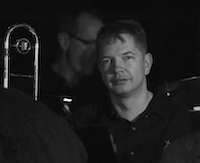 Ron Wrigley — Piano — Has played with many bands but recently settled with us. Occasionally hangs out at Koi open mic. Doesn’t know any funny stories about himself. 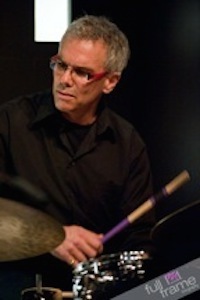 Bryan Niblock — Drums — An impressive knowledge of all things drums. Sells implants as a day job. Has a wine collection with more than a dozen bottles. 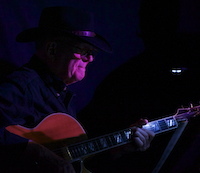 Brian Chellas — Guitar — Another long serving member of the band. Retired from his day job as a philosophy professor one year, and within two years became seriously good. Camera shy. Mari Jo de Waal — Fan of jazz and the Great American Songbook from an early age. Partied with the band even before she decided to seriously perform jazz. 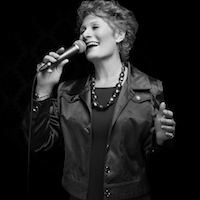 Wendy Lomnes — Singer, jazz lover, hiker, traveler, retired geologist.